Is the 9/11 memorial museum gift store a tasteless idea? Home Scandal and Gossip Is the 9/11 memorial museum gift store a tasteless idea? A good idea or just outright offensive? Attendees and relatives of the fallen have been left horrified after visiting the 9/11 memorial gift store which part of its vernacular is offering a collection of kitsch memorabilia for sale while sitting directly above the remains of up to 8000 body parts. 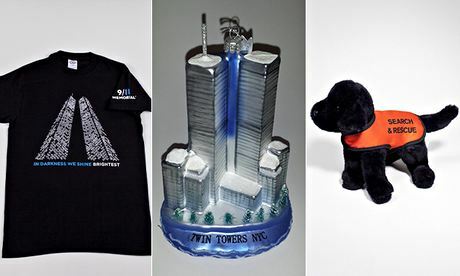 Token items for sale include toy rescue dogs, baseball caps, glass ornaments of the Twin Towers and even flags, badges and magnets will be available for visitors to purchase. Interestingly according to the store’s website, only a few of the ‘national’ items are actually made in the USA. While the museum’s website explains how the the proceeds benefit ‘developing and sustaining’ the memorial which is run by executives with privately-funded six-figure salaries others are not necessarily so convinced what’s for sale (let alone selling having a gift store in the first place) is the right thing given the gravity of the incident which led to so many lives being lost on Sept 11, 2001. Joe Daniels, the memorial and museum’s CEO, makes a cool $378,000 a year, though his and other executives’ six-figure salaries are funded through private donations. Still, the idea of a gift shop doesn’t sit well with many close to the tragedy, who believe it could have been kept closed until Wednesday, when the museum opens to the public. Since President Obama opened the museum this past Thursday, the memorial has since only been open to survivors and victims’ families. However, Mr Feal, who runs the FealGood Foundation for ailing 9/11 workers, says he understands the museum’s need to sell items in order to cover costs. The museum plans to operate on a $63million budget with money raised through admission fees and donations. Token items for sale include the following: FDNY, NYPD and Port Authority Police T-shirts ($22) and caps ($19.95); earrings molded from leaves and blossoms of downtown trees ($20 to $68); cop and firefighter charms by Pandora and other jewelers ($65). Other items for sale include the black twin towers hoodie emblazoned with the words, “In darkness we shine brightest” ($39). There is the silk scarf printed with a full-colour twin towers design ($95). There is even the Search & Rescue Dog cuddly toy ($19.95).